Sources told NBC Bay Area that Cuen was arrested last year for a burglary in the same area, and in that case, the victim was also an elderly woman. The family of an 88-year-old San Jose woman clinging to her life after being brutalized during a home invasion robbery implored the community on Thursday for continued support, a few hours after sheriff's deputies arrested a 19-year-old man on probation in connection with the savage attack. "This is sad, this is horrible, this is the most deplorable act I've ever witnessed in my entire life of someone beating an 88-year-old woman like this, and we still need your help," Flo Douglas' nephew Michael Wallace said. Wallace spoke at a news conference held by the Santa Clara County sheriff's office, where officials announced the arrest of Zachary Cuen of San Jose on suspicion of severely beating Douglas during a home invasion robbery Monday, leaving her hospitalized in critical condition. Douglas, who is known as Ms. Flo, had told investigators she was beaten by two men who broke into her house through a side door. Undersheriff Carl Neusel assured the San Jose community that they are safe, now that Cuen is in custody. But he added that investigators are still looking into whether he had an accomplice. Neusel said that deputies scoured Douglas' house, canvassed the neighborhood and talked to residents before identifying Cuen as a potential suspect. "Physical evidence" at the crime scene linked Cuen to the attack, Neusel said, declining to provide further details. Deputies put Cuen, whom they described as a "violent predator," under 24-hour surveillance, before taking him into custody Wednesday, the day before he turned 19 years old, Neusel said. Neusel called Douglas a "beloved and cherished" community member, and thanked her "wonderful neighbors" who sensed "something was amiss" and acted on it. They ensured that the victim received necessary medical attention, he said. "When we have a very petite 88-year-old woman who is just the bastion of the community and neighborhood she lives in, and is highly regarded as just the sweetest, most [kind] person, yes, that gives us additional motivation," Neusel said. "This was such a heinous and brutal attack, it reached to the very core of this department." 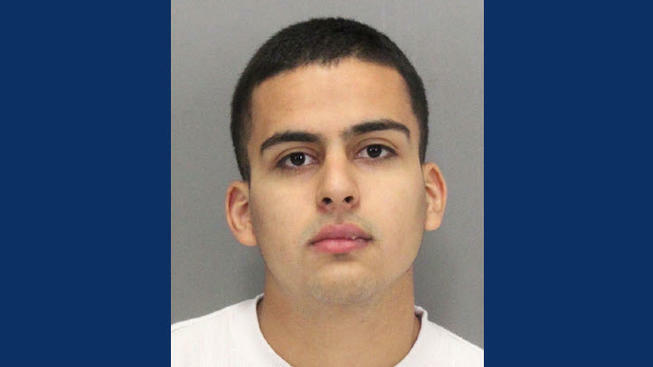 Santa Clara County court documents show that Cuen was on probation at the time of his arrest. He was charged with auto theft and hit-and-run in February, and pleaded not guilty. Documents also reveal Cuen has a history of drug abuse. Sources told NBC Bay Area that Cuen was also arrested last year for a burglary in the same area, and in that case, the victim was also an elderly woman. Cuen allegedly committed a similar crime as a juvenile, too, they said. Douglas' relatives said the matriarch of the family didn't deserve the brutality Cuen is accused of meting out. "My grandmother is a peaceful, loving woman who has lived there since 1964," said Jocelyn Wallace Lewis, the victim's granddaughter. She teared up as she beseeched neighbors to contact the sheriff's office if they witnessed anything or could share surveillance footage. Michael Wallace, a pastor at Oakland-based Mount Zion Missionary Baptist Church, echoed the sentiment and asked people to pray for his aunt. Everyone should be able to feel safe in their homes, he stressed. Douglas too had "the right to enjoy the peace and tranquility ... [of] the home that she had lived in for so many years," Wallace said. "And that was brutally and abruptly interrupted a few days ago, and now, here she is ... fighting for her life because someone came into her house and beat her so savagely." As of Thursday afternoon, the elderly woman remains in the Intensive Care Unit with severe trauma to her head and face, and her family is pleading for justice. "It was my grandmother, but it could be yours," Lewis said. Douglas' family has created a GoFundMe page to help raise funds for her. As of Thursday afternoon, 12 people had contributed $565 of a $20,000 goal. The community is holding a meeting at St. John Community Center at 7 p.m. Thursday so people can discuss ways to make the neighborhood safer.